Whether an expert or beginner golfer, more and more women golfers will receive an invitation to play business golf. In additional to a corporate golf event, more charities are using golf as the venue to raise both awareness and funds for their cause. Here are some tips to make your golf experience stress-less, enjoyable and productive. Tip Number One: Be comfortable with your appearance. Tip Number Two: Play in your comfort zone. If you are a very good golfer with a handicap of ten or less — only ten percent of women golfers are in that zone – you should be comfortable accepting an invitation to play golf with anyone – anywhere. Your male team colleagues and clients will love to play with you especially when you tee it up from their tees. At the other extreme, if you have played only a few times and are still whiffing or dubbing balls, it may be best to decline the invitation until your game improves. However, if you are invited by another beginner golfer and together you can manage your expectations, it could be lots of fun for both of you. Another exception would be if you are invited to a corporate golf event that is clearly advertised as “fun” and uses a “scramble” format. In a scramble format, you can always be your team’s star putter on the green. Most women golfers fall in between the extremes. So how good do you have to be for business golf? Here’s a guideline: Most-of-the-time, you should be able to hit a ball about 100 yards off the tee, hit a middle iron (or hybrid club) at least 75 yards on the fairway, hit out of a bunker successfully two out of three times, know how to reach a green when you are 50 yards from the flagstick, take only one practice swing, three-putt or less on most greens, know proper green etiquette and know when to give up and put the ball in your pocket. Tip Number Three – Play quickly. How do you know if you play fast enough? Take my “pace-of-play” test on a day when your course is not busy. Play 9 holes just by yourself, and see if you finish the nine holes in 90 minutes or less. If you pass that test, you have a good pace-of-play and should be comfortable accepting most business golf invitations. And remember: Unless you are playing in serious competition, if you are having a very bad hole, it is usually okay to pick up your ball saying “I’m out of this hole.” And hope for miracles on the next tee. If using an electric cart and playing with a man, it is usually faster if the woman drives, especially if she knows the course better. After the man tees off — often from the longer tee, then she can drive to the forward tee with ball in hand and quickly tee off. Of course, if the man you are playing with automatically sits in the driver’s seat, let him stay there! Tip Number Four: Know when to talk about business. Believe it or not, men seldom talk shop on the course. So, if you are playing with men, do not talk about the office or your new product or the next sale until the round is finished – maybe over a drink on the 19th hole. Build the relationship on the course but make the sale the next day. Tip Number Five: Don’t be afraid to invite colleagues to play golf. If you are a good golfer and know your comfort zone, don’t hesitate to invite female or male colleagues for a round of golf. You do not have to belong to a fancy private club to provide your guests with a good golf experience. There are many excellent public facilities. When inviting guests to play always check ahead to find out about dress codes, locker room facilities, on-course amenities including beverages and fool-proof directions, and check on cell phone policies. Make sure that the tee-yardages will work for you and your guests. Always check the forward tees. Any course with a USGA Slope from the forward tee of more than 125 — or one that plays longer than 5300 yards from the forward tee – could have challenging features for women golfers. Don’t forget to make a specific tee-time reservation at the golf course! Tip Number Six: Host a group lesson. Many women are interested in learning to play golf. Consider hosting a group lesson just for your colleagues. Ask a local instructor that you have met and liked to provide a private lesson either on the practice tee or on a few holes on the course. Include lunch or cocktails if within your schedule and budget. For help in finding an instructor go to www.lpga.com or www.playgolfamerica.com. Both sites offer sections that allow you to search by zip codes for professional instructors. Whether it’s a call the next day to say, “How about that contract?” or a “Thank You” note to cement a relationship, think about your golf experience as an on-going investment. You are guaranteed to make new friends and hopefully improve your bottom line in business — and on your scorecard. Nancy Berkley is an expert on women’s golf and junior-girls golf in the U.S. A special interest of hers is encouraging business women to enjoy golf with colleagues and clients. 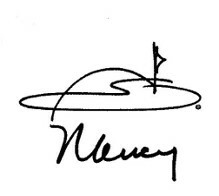 Nancy is a member of the World Golf Foundation Women’s Committee, and a member of the National Golf Foundation. Nancy is a graduate of the University of Minnesota, Harvard University, Rutgers Law School and has a degree from the Professional Management Program of Harvard Business School. Describing herself as a good bogey golfer with permanent potential Nancy’s message to women is “Be Happy, Be Healthy, Live Longer, Play Golf.” She shares news about women’s golf – along with her opinions on www.berkleygolfconsulting and www.nancyberkley.com. *Photographs (in order) by Hot Springs Village Akansas, Stacey Huggins, and Dennis Markham used with permission under (Creative Commons License).